We are all familiar with the saying “when there’s a problem, there is a solution too”. Most of us believe in this theory and that keeps us going in the most difficult times of our lives. What about those who need some help in understanding this theory? Who need some guidance in their lives? We are talking about the current generation here. Most of the students take up science in school followed by engineering in college & later on apply for an MBA. What a valuable package of courses, right? But why do most of the Engineering students opt for an MBA rather than a specialized Masters in their own field? It is because most of the students are unaware of their personalities, interests & desire in life. They are often advised by their parents, siblings or neighbours. Their choices limit to either Science, Math or Arts (rarely). Do we blame the Students? Parents? Teachers? Or the School? Imagine if students and parents could speak to a professional about their career plans and opportunities. Only to get perspective, vision & motivation in return! Wouldn’t that be great? Well, let’s learn more about it today. Ever heard of Career Counselling? Most of you must be having a typical picture of an aged person on a desk with plenty of books and knowledge to share. But that’s not what Career Counselling looks like. Career Counselling needs one to be a good listener, a friendly advisor. Someone who can bring out the interest and potential of a candidate and guide him/her towards the right career path. The profession has a vast scope in its industry. It offers various kinds & types of services. A Psychologist, Teacher, Administrator, Doctor, Housewife or a Freelancer, anybody can opt for a Career in this industry. If you are confident and have a passion for making someone’s life better, the door’s open for you! 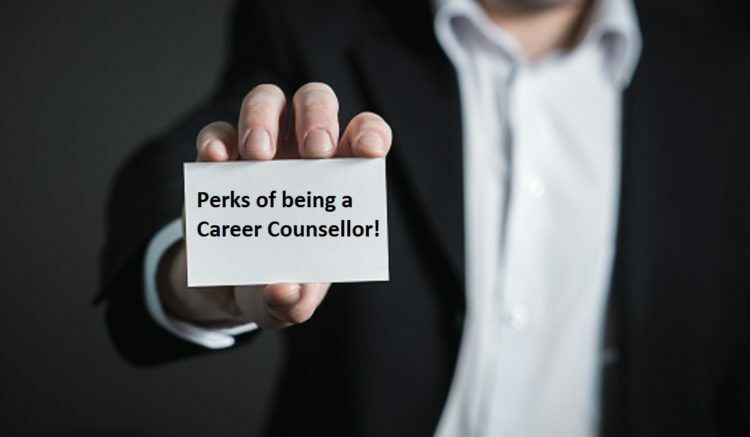 Do you understand what the job of a Career Counsellor is like? Identifying an individual’s strength, weakness, opportunity, and threat. Understanding their interest & desire in life. Can you do the talk? It is not only about what course you have to offer, or what type of career opportunity is in the trend these days. It is most importantly about listening & understanding the interest and thought of an individual. To be a good listener is all that it takes. That’s how you build trust & a strong connection with the Students are sensitive, curious, confused and have multiple thoughts. They need somebody who would accept them and welcome their thoughts. If you understand the above and believe you have these qualities in you, then you’ve hit the bullseye. Your dream career is waiting for you. If you believe in contributing to someone’s life, then you’re not so far away from becoming a great Career Counsellor. It is the destiny of a few to mentor greatness, here’s your chance. With a growing demand for Career Counselling in India, there’s a higher scope for you to grow as a professional. GCC is Asia’s first Global Career Counselling Program in partnership with UCLA Extension. I am a retired person.I was a class 1 gazetted officer.could I do the course. I am the IGCSE- Cambridge Exam Officer in International School. I like to take this course and become a Career Counselor too. Please send me the details for the program and fee. Respected sir/madam I have been giving guidance to school,collage of Maharashtra state,so far I have covered Ahemadnagar, nashik district,please advise. I am interested in the course, I want to know the duration and the cost of course.